An easy breakfast the entire family will love! 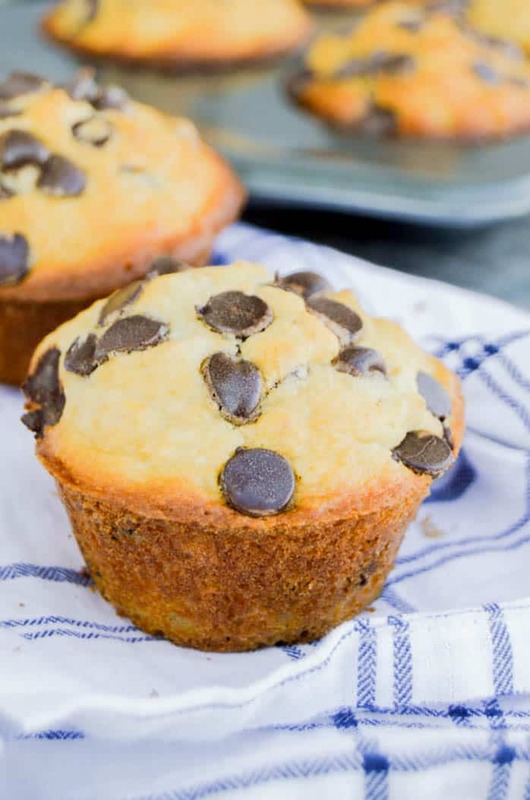 These Chocolate Chip Oatmeal Muffins make an easy breakfast recipe plus they are so simple to freeze! I think muffins are my kids favorite breakfast item! 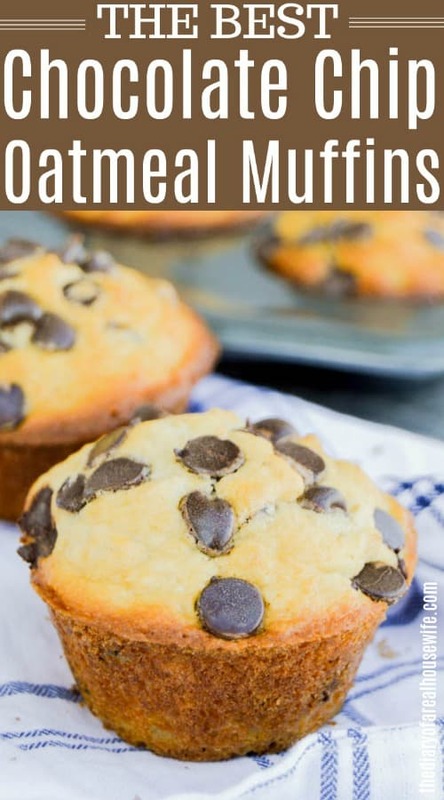 They are pretty high on my list of favorites also and these Chocolate Chip Oatmeal Muffins are easy to make plus they taste amazing. I usually serve mine with fresh fruit yogurt, and of course a big cup of coffee for me! If you are not a morning person or you just have busy mornings then make sure to check out how I freeze these muffins for a quick re-heat in the morning. When you re ready to start cooking go ahead and preheat your oven to 400 degrees. Then prepare a muffin tin with non stick cooking spray or muffin tin liners. Whisk together oats, flour, sugar, baking powder, and salt in a large mixing bowl. In a separate bowl beat eggs then add it to other ingredients. Add milk and oil to the large mixing bowl with ingredients and mix until combined. Fold in chocolate chips. Spoon dough into each muffin tin about 3/4 way full. Bake for 17-18 minutes or until muffins are cooked though and a toothpick can come out clean. Can I freeze these Chocolate Chip Oatmeal Muffins? Freezing these muffins would make for a great breakfast when you are in a pinch. Follow the directions above and once your muffins are done allow them to cool on a cooling rack (or toss them on a plate) until they are completely cooled. You can wrap each muffin in plastic wrap and place them in a large freezer bag. Add the name and data to your freezer bag so you don’t forget. These muffins should last 2-3 months once frozen. When you re ready to eat them remove them from wrapping and warm in the oven at 350 degrees for about 10-15 minutes. 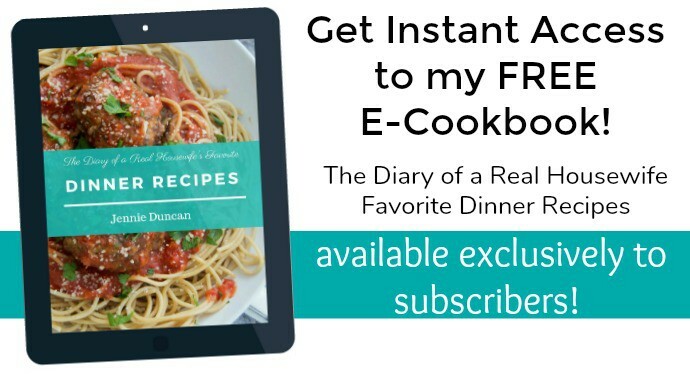 You could also use a toaster oven or microwave for quick warm up. Pumpkin Oatmeal Chocolate Chip Cookie: I LOVE anything with pumpkin spice and these soft and chewy cookies are the BEST. Chocolate Chip Oatmeal Cookies: I love oatmeal raisin cookies but I make a chocolate chip version that my kids love so much more. Preheat oven to 400 degrees. Prepare a muffin tin with non stick cooking spray or muffin tin liners. Whisk together oats, flour, sugar, baking powder, and salt in a large mixing bowl. In a separate bowl beat eggs then add it to other ingredients. Add milk and oil to the large mixing bowl with ingredients and mix until combined. Fold in chocolate chips. Allow the dough to sit for 30-35 minutes covered for oatmeal to soften. Spoon dough into each muffin tin about 3/4 way full. Bake for 17-18 minutes or until muffins are cooked though and a toothpick can come out clean. I only baked mine at 350 degrees for 30 minutes and they were perfect. SO glad you like them Linda!! yummy! my kid’s favorites are raspberry from our garden. 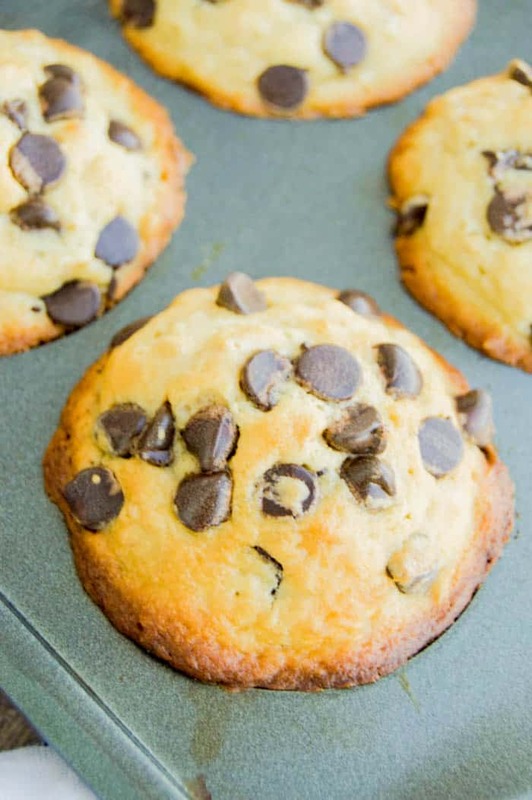 or pumpkin chocolate chip muffins…. Yum! I will have to try it like that!! Can you substitute almond milk for milk? Hi Paige, I have not yet tried that but most of the time you can substitute almond milk for the same amount of milk. I would love to know how they turned out! I made mine with white chocolate chips and craisins.